While looking for the perfect gift for your friends and relatives, it is good to know that whe thought about a gift for you too! This pretty Christmas ornament in painted wood has been designed by The Bee Company for SoCreaStitch. 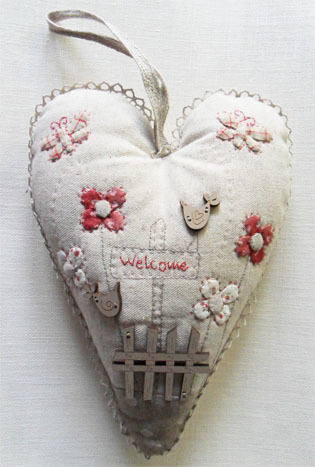 It is a small garland composed of two hearts (approx. 6,5cm high) and two stars (approx. 6 cm high). This gift will be enclosed with all December orders above £30 before P&P. We hope you will enjoy it and that it will part or your Christmas decoration for many years! Merry Christmas with a bit of advance! One thing we love with Corinne, the designer behind Tralala, is her hability to provide us with so many charming cross-stitch designs. A fresh proof of it is in this gorgeous and so stylish "Parisienne" design. We pride ourselves to stock the complete Tralala Collection. So if you haven't checked it recently, take a quick look at it as we very often add new patterns in this category. The same goes for the other designers we display in our pages, so if you "need" a pattern you don't see online, just ask for it as we probably have it! Add this lovely Christmas quilted panel to your collection of hand-made ornaments and enjoy it for many years to come! 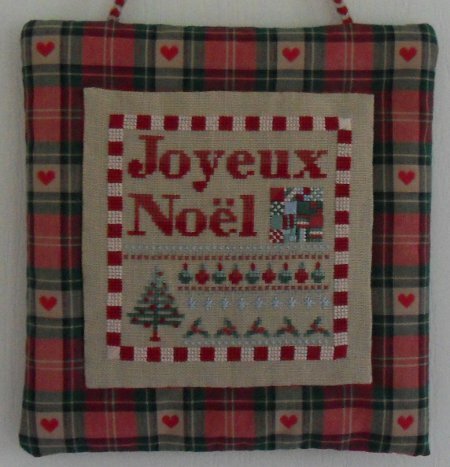 We have prepared for you a complete kit including the original "Joyeux Noël" cross-stitch design by Les Creations de Chrystelle as well as everything you will need to make this little quilted panel and detailed instructions in English. The kit costs £19,50; click here for details. Discover The Bee Company products which, despite the name, are French! These lovely hangers, buttons and frames in painted woods are all designed by Delphine from Les Boutis de Lucie. They will embellish all kind of stitch works. We hope you will like them as much as we do! We are back from the Knitting and Stitching show (Alexandra Palace, London) where we really had a great time: thank you to all of you who came to visit us! We can now present online some of the new products launched during the show. We are particularly pleased to welcome the new designer Les Boutis de Lucie (you can see one of her lovely "patchwork kits" on the left). 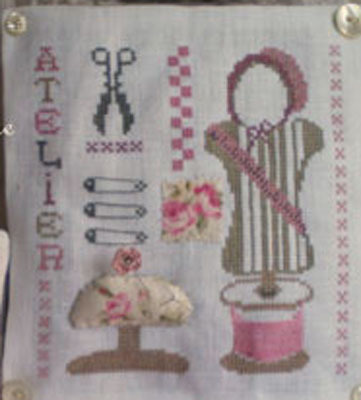 Doing so, we widen our range of products to other stitching techniques even if we remain a French boutique selling mainly cross-stitch products and stitching accessories. We've had also many requests for kits during the show so we'll add some regularly from now on. Here is the 1st one: Amitiés Alsaciennes" by Le Lin d'Isabelle. We are currently away at The Knitting and Stitching Show, Alexandra Palace, London (6-9 October 2010, Great Hall, stand n°E27). Meanwhile the online boutique remains opens and you can place an order as usual. 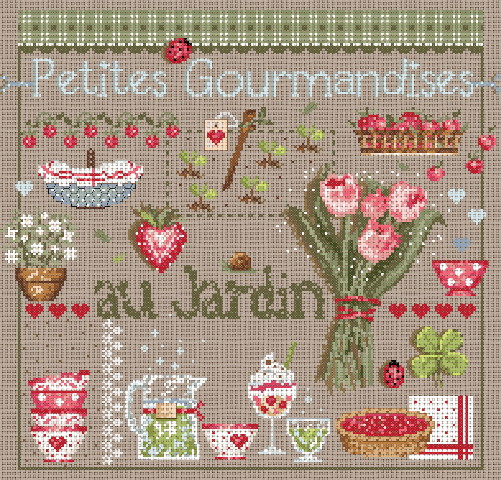 (Why not have a look at the gorgeous latest design by Madame La Fée, Passion des Roses?) but please be aware that some products are momentarily unavailable (in the "Embellishments" section). They are indeed in limited edition and we can't know what will be the stocks after the show. All orders will be processed as soon as possible when we get back (11 October). Have you noticed there is a quite unusual category on SoCreaStitch called "a stitcher's life"? This is the part of the website where you find patterns for Biscornu pin cushions and also a lot of designs featuring needleworks in general with embroidery scissors, reels of threads, antique sewing machines, ribbons and lace, haberdashery ... You find also other kind of products provided that they are related to the stitchers' life: ready-to-stich Stitcher's cases made in France, buttons and decorative pins in the shape of cotton reels, etc. To see only the new designs added in this category, click on "read more" below. Click here to see the whole "Stitcher's life" category. We've been back from our summer break for a week now and busy processing all the orders that came through while we where off. Thank you! For those of you who are still expecting a delivery, don't worry, it should be here very soon now as all the pending orders have been sent out. This means that our usual "goods sent out withing 24h after the order" standard applies again. So we can now focus on new designs for you to enjoy! 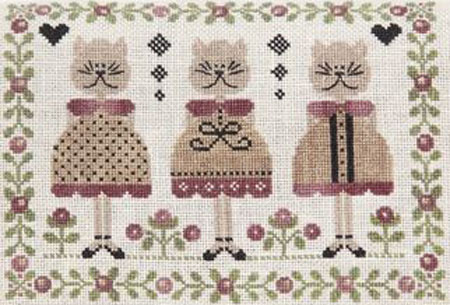 We are about to receive several new Christmas patterns by Alice and Co, among which this one. They will be online whithin a few days as well as a selection of lovely patterns in another of our favourite theme: "A stitcher's life". This gorgeous new design by Madame La Fée, just released in France, seems to be the perfect image to announce SoCreaStitch's summer break. During this time, your online boutique is open and you can place an order as usual. But our standard delivery time won't apply. There will be no goods sent out from 1st August to 15th August. Deliveries will resume from the 16th August and our usual 24H delay for packing and shipping from the 24th August. Enjoy a wonderful summer full of stitching! Read more: Cross-stitching our pet friends! This month, the beautiful pins by the French designer Butterfly Couture are highlighted in two magazines: Cross-Stitch Gold and the World of Cross-Stitching. Many thanks to them! 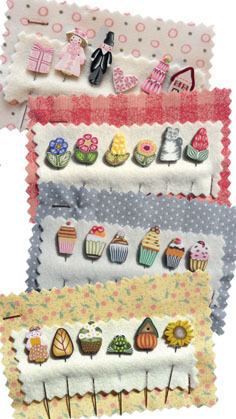 You will find all our decorative pins in the Embellishments section or just by clicking on the image. They are all in limited edition and the designer never makes twice the same (which would be just impossible). So if you do like one set of 6 pins, do not hesitate too long! 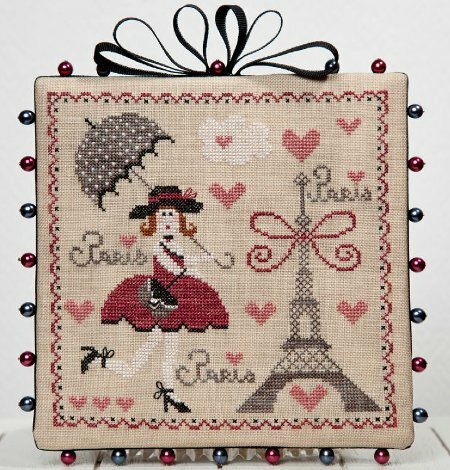 Releasing this new design English Dolls by Malin Maline, we've thought that a small review of our "least French designs" could interest you, as they are all dispatched in our various categories of cross-stitch patterns. Many French designers (and stitchers) do like what we call, here in France, "le style anglais": colours, tea, cakes, many topics from across the Channel inspire us.